Is he available? Depends who you ask. A report recently surfaced suggesting Calgary was receptive to offers, despite having just acquired him last summer. 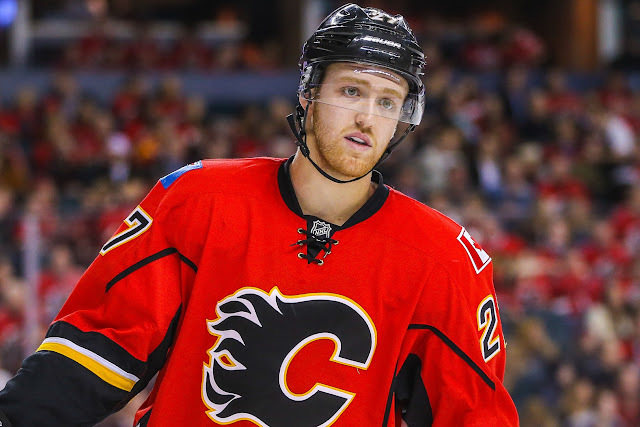 The Flames do have a ton of money committed to their blueline, but still, it seems strange. Skinner has been in trade rumours for what, four straight years? Between underperformance and injury, it seemed the ‘Canes wanted to divest of the young (expensive) asset. After a strong 2015-2016 NHL season, the rumours have gone a bit quieter - for now. Landeskog popped up in rumours this past summer, which was part of a bizarre theme of rumours coming out Colorado that they were looking to shake up their core. Apparently talks progressed around the draft, with the Canadiens and Ducks as rumoured possibilities. With Patrick Roy out of the management mix, the rumours buzz around the team has decreased. Despite being a key piece on a playoff team, the Stepan rumours started appearing last season. His big $7.5 cap hit might be part of the reason why. Nonetheless, Stepan remains with the Blueshirts and it doesn't appear he's being forced out. Bob’s name came up at the 2016 NHL draft as a possible option for the Calgary Flames (who have acquired Brian Elliott, but not extended him as of yet). The Blue Jackets are in a difficult cap situation, and many rumours have cropped up on their big salary players. Things have cooled off on this front, but it’s something to keep an eye on. Malkin comes up in trade rumours every summer, with reports indicating “this is the year” they move him. The more the Penguins win, the less likely the move seems. But when there’s this much smoke there’s usually some fire...right?